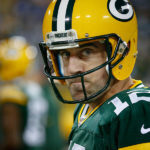 Photos From The Green Bay Packers vs Arizona Cardinals NFL Football Game. August 9, 2013. 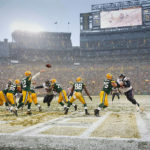 The Green Bay Packers lost to the Arizona Cardinals 17-0 at Lambeau Field on Saturday night August 9, 2013 to kick off the preseason. 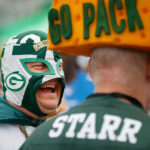 It was the first time the Packers had been shut out in a preseason game since Hector was a pup and they played half their games at County Stadium in Milwaukee. I started my day at Lambeau by heading to the newly opened south end zone expansion and getting the view of the field from up there. I really like the shot I got of Packers kicker Mason Crosby warming up from mid field right in the middle of the Packers G. It was also one of the first times most season ticket holder would get to sit in their new seats so I tried to record that. As for the game I did okay if what your trying to do is get the scoring plays. I got some nice action and reaction of the Cardinals touchdowns. Maybe my favorite photo from the game is Packers offensive lineman Josh Sitton modeling a Gilligan style Packers hat while spitting. I’ll be on the road for a week long out of state commercial photo shoot when the Packers play their next preseason game at Lambeau and I’m okay with that. 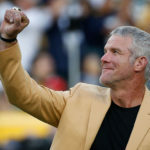 I’m looking forward to the start of the regular season and the excitement that brings. Green Bay Packers kicker Mason Crosby practices from the 50 year line before the game. 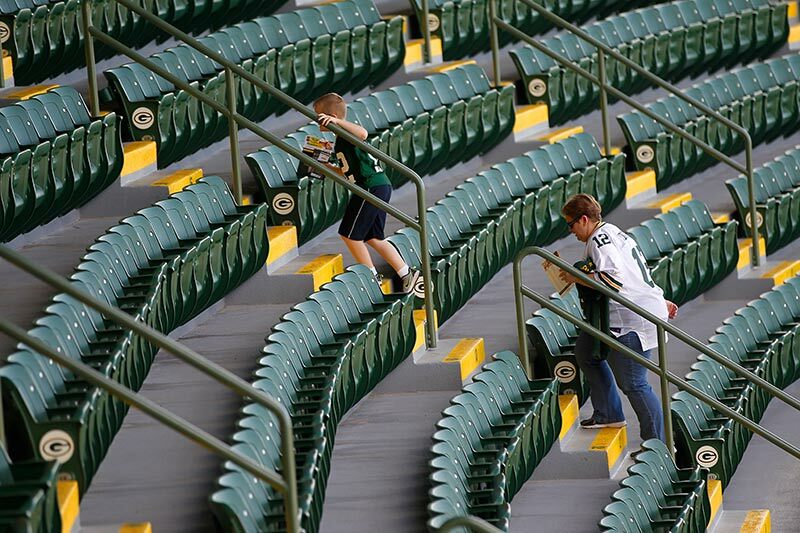 A couple of young Packers fans get to their seat early. Fans head to their seats in the newly opened south end zone expansion. 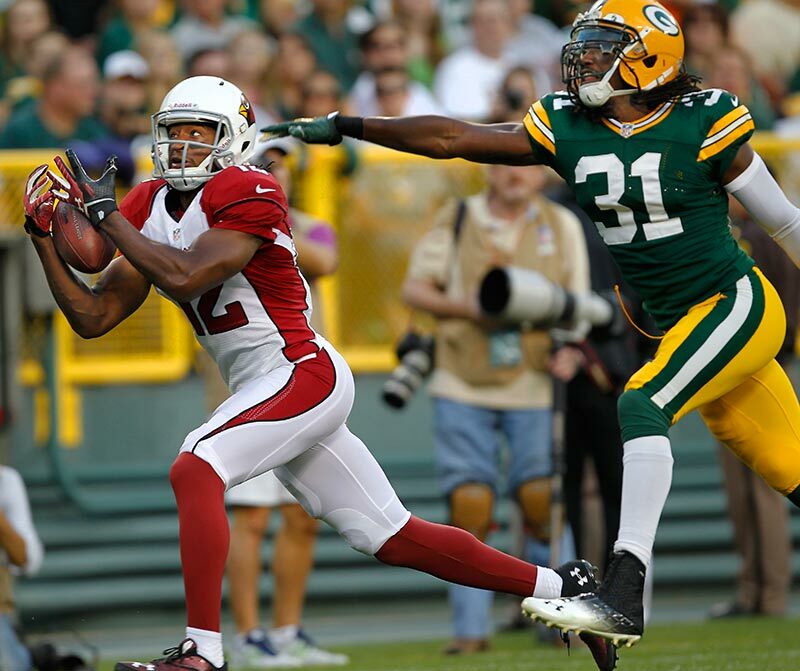 Arizona Cardinals wide receiver Andre Roberts pulls in a pass in front of Green Bay Packers defensive back Jerron McMillian. 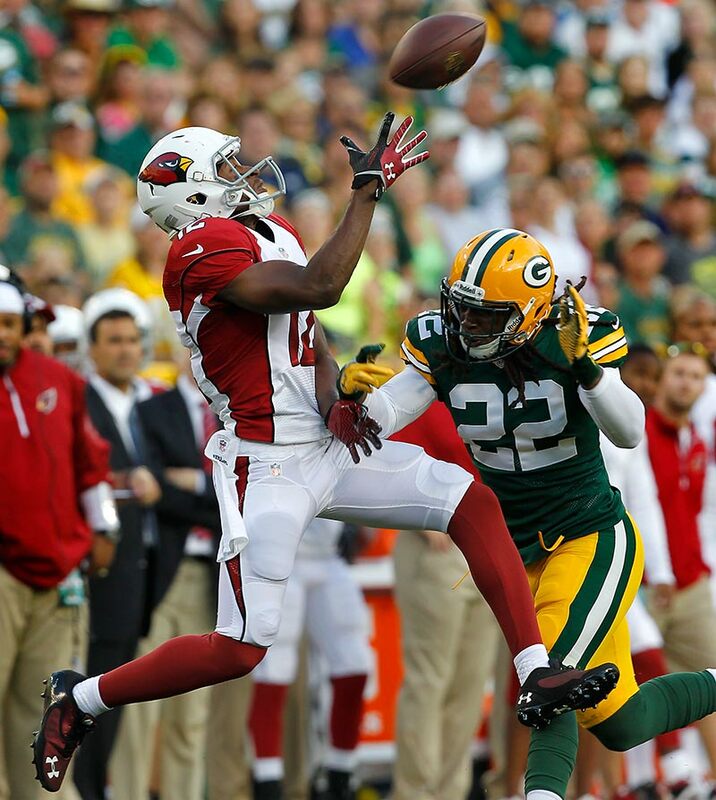 Arizona Cardinals wide receiver Andre Roberts pulls in a touchdown pass as Green Bay Packers cornerback Davon House tries to defend. Arizona Cardinals wide receiver Andre Roberts salutes his touchdown. Arizona Cardinals wide receiver Andre Roberts celebrates his touchdown with Arizona Cardinals quarterback Carson Palmer. Green Bay Packers guard Josh Sitton models the Packers Gilligan hat and accessories with a little spit. I will call this picture Spittin Sitton. Arizona Cardinals wide receiver Jaron Brown pulls in a touchdown as Green Bay Packers cornerback Micah Hyde defends. 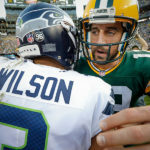 I have no idea what Arizona Cardinals quarterback Drew Stanton is trying to tell Green Bay Packers quarterback Aaron Rodgers and Green Bay Packers inside linebacker A.J. 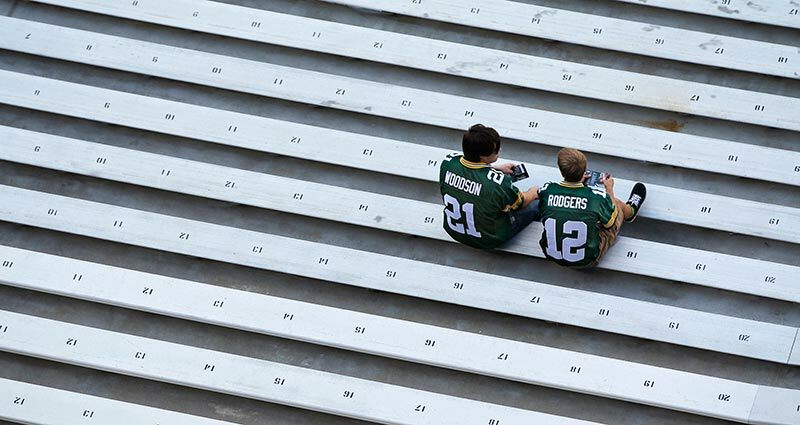 Hawk after the Packers got shut out at Lambeau during their preseason opener. « Wisconsin Triathlon Photographer • Photos From The 2013 Door County Triathlon.